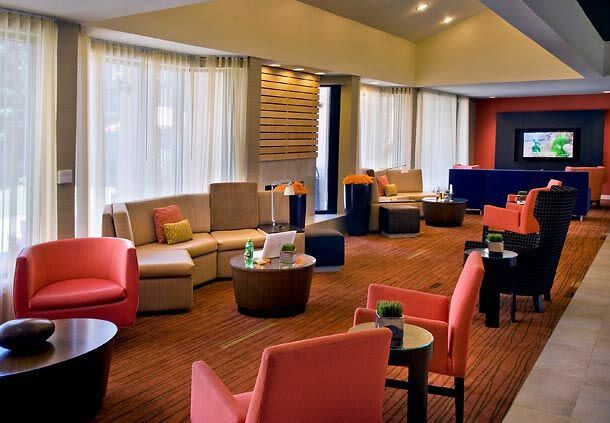 The Courtyard by Marriott Newark International Airport Hotel features a recently-renovated lobby with inviting, flexible spaces to work or relax in, free Wi-Fi throughout and easy access to the latest news via our GoBoard. The highlight of our lobby experience is The Bistro – Eat, Drink, Connect. – which provides guests with healthy food and beverage offerings in the morning and evening dinner service with cocktails. Our Newark Airport (EWR) hotel is conveniently located near downtown Newark and just two miles from the Prudential Center - home of the the NHL's New Jersey Devils. We offer complimentary shuttle service to EWR Airport and provide easy access to NJ TRANSIT. At our hotel, all guest rooms have a fridge, you can enjoy a fitness center, indoor pool, whirlpool, 24-hour business center, boarding pass printing services, luggage weight scales. Your stay at the Courtyard Newark Liberty International Airport Hotel is sure to be more comfortable, more productive and most importantly, more enjoyable.